Halvergate post mill on Mill Road, stood on its roundhouse close to the mill house on the south side of the village. The road running past had a slight kink as it passed the mill to accommodate the tailpole track. The mill used a pair of common sails and a pair of patent sails to power 2 pairs of French burr stones, a flour mill and jumper. One pair of stones was 5ft diameter and the pair other 4ft 6ins. 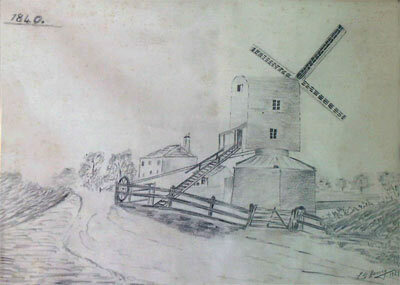 The mill was eventuallly dismantled and replaced by Halvergate towermill. A POST WINDMILL situated in the parish of Halvergate in the county of Norfolk, with two pair of French stones, one pair 5 ft., the other 4 ft. 6 ins. & flour mill complete. Also a roundhouse & granary over the same, with cottage & garden there unto adjoining. The above premises are freehold & in good repair. Apply to Mr. Robert Bately in the parish of Halvergate aforesaid. An excellent POST WINDMILL at Halvergate with two pair of French Stones nearly new, Flour Mill & Jumper. Also a DWELLING HOUSE adjoining the mill with an excellent garden containing about half an acre well planted with fruit bushes. These premises are within a short distance of the navigable river to Yarmouth, are freehold & now in the occupation of Mr. John Larter, the proprietor, who will give possession thereof at Michaelmas next. Apply to Sewell & Blake, Solrs. Norwich. A Capital POST MILL with two pair of French Stones, Flour Mill & Jumper; together with a newly erected brick Dwelling house, garden, stable & necessary offices. All Freehold. Apply to Mr. John Larter, the proprietor, Halvergate, Norfolk. Have received instructions from the Proprietor to sell by Auction on Saturday 23 August 1851 at the Norfolk Hotel, Norwich, at 3 o’c the following Freehold Estate situate in the Parish of Halvergate 4 miles from Acle, 3 from Reedham Station & 13 from Norwich. A POST WINDMILL in full Trade driving two pairs of French Stones, with two new spring & two common sails, iron shaft new about 12 months since, flour mill & every fitting requisite for carrying on the business. The Mill stands well for wind in a neighbourhood calculated to command a continuance of the excellent trade that is now attached to her. Adjoining is a comfortable Dwelling House …. Also stables, gig house, cow house, piggery, malthouse & other buildings & a productive Garden walled in to the north. The Property is in the occupation of Mr. John Hewitt. Particulars of Mr. F. Fox, Solr. Rampant Horse Street, Norwich or of the Auctioneers, Norwich & Yarmouth. At the Hare & Hounds Inn, Halvergate on Thursday 4 March 1852 at 4 o’c in 8 Lots. Lot 8. All that capital Freehold Post Windmill in full trade with roundhouse, driving two pairs of French Stones, with two spring & two common sails, iron shaft (new in 1850) with Flour Mill etc. complete. The Mill stands well for wind & in a neighbourhood calculated to command a continuance of the excellent trade now & for many years past attached to it. Together with a comfortable Dwelling House. Also Stables, Gig house, Piggery, Malthouse & other convenient outbuildings with a productive Garden walled in to the north. This lot is in the occupation of Mr. John Hewitt under a Lease for a term of which 5 years will be unexpired at Michaelmas next at the yearly rent of £45. Particulars of Mr. Sayers, Solr., Mr. Stacey, Estate Agent & Appraiser, Howard Street, Great Yarmouth, the Auctioneers, Loddon & Southwold & at the Hare & Hounds Inn, Halvergate. Wanted, a steady middle-aged man, in a Post Windmill. Must have three years good character from his last master. Apply to Mr. J. Hewitt, Halvergate Mill, Acle.